Playing some catch-up from Capital Hill Ocean Week. We served on a panel yesterday and gave a presentation on the spill (starting at 36:10 in this video). Thanks for your patience, we’re stretched pretty thin! 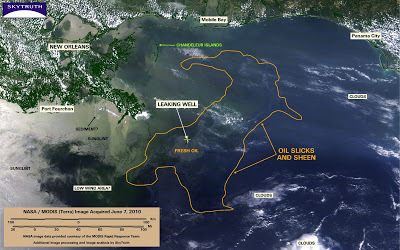 We don’t think the actual area of ocean affected by slicks and sheen nearly doubled in just two days; instead, we think the MODIS image from June 9 was just much more effective at showing those areas than many of the images we’ve been collecting throughout this incident. 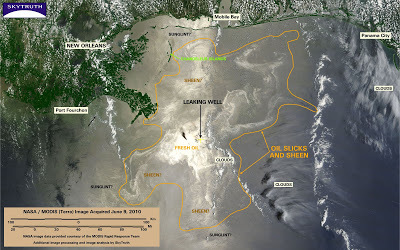 And it is possible that some of the area we’ve delineated contains natural surfactant rather than spilled oil. Again, a difficult image to interpret in some areas. The crude oil is toxic!! Workers cleaning the oily Gulf beaches need to know the danger. Don't become BP's Collateral Damaged, like Exxon’s Collateral Damaged. My name is Merle Savage, a female general foreman during the Exxon Valdez oil spill (EVOS) beach cleanup in 1989. I am one of the 11,000+ cleanup workers from the Exxon Valdez oil spill (EVOS), who is suffering from health issues from that toxic cleanup, without compensation from Exxon. Dr. Riki Ott visited me in 2007 to explain about the toxic spraying on the beaches. She also informed me that Exxon's medical records and the reports that surfaced in litigation by sick workers in 1994, had been sealed from the public, making it impossible to hold Exxon responsible for their actions. Exxon developed the toxic spraying; OSHA, the Coast Guard, and the state of Alaska authorized the procedure. Beach crews breathed in crude oil that splashed off the rocks and into the air — the toxic exposure turned into chronic breathing conditions and central nervous system problems, neurological impairment, chronic respiratory disease, leukemia, lymphoma, brain tumors, liver damage, and blood disease. My web site is devoted to searching for EVOS cleanup workers who were exposed to the toxic spraying, and are suffering from the same illnesses that I have. There is an on going Longshoreman’s claim for workers with medical problems from the oil cleanup. Our summer employment turned into a death sentence for many — and a life of unending medical conditions for the rest of Exxon’s Collateral Damaged. This is horrible. The animals as they get covered in oil, are dieing. I feeel like I could do something- but I know I can't. Well, there is some things some of you can do. If you have long hair- go to a hairdressers and you can get it cut for the oil spill. They take the scraps of your hair and it soaks up the oil which prevents sokm from leaking out everywhere. I know it will hardly help- but if you get friends to do it to- it will make a big difference. Selena – it is very bad. I think I read that the Coast Guard is not using hair-filled booms. 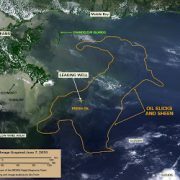 But there is something everyone can do to help reduce the chances of another big spill like this: use less oil and gas. Merle – thanks for pointing out this important information. After what you've already been through with EVOS, I'm sorry you have to see yet another big oil spill on our shores. thank you for all you are doing to shine the light of truth on this disaster. I live on the Gulf Coast of Florida. We have oil on Pensacola Beach, and my relatives who fished in the Gulf yesterday say there is a sheet of oil about 2 miles off the coast (as of yesterday). 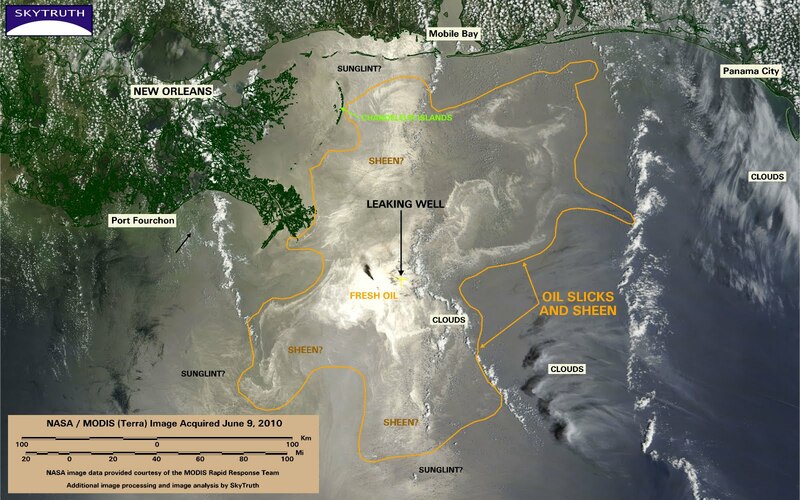 I wish I knew how to pressure our government and BP to use the oil-consuming microbes to save our habitat and our economy, so dependent on tourism and fishing. Thank you for all the work you are doing. This site has been my primary source of information concerning the spill since I discovered you 4 weeks ago. I continue to be dumbfounded with how the media and government take BP statements as facts with no further investigation. Sarisa – thanks for the encouragement. It helps keep us going. Dragonfly – I hope that oil stays offshore and they can clean up your beach quickly. Consider submitting a report with a few photos on our Gulf Oil Spill Tracker site – if you've got an iPhone, try our free iPhone app for submitting reports. We're building a record of impacts of this spill around the Gulf region.